Nightwatch hours at a north-east harbour have been extended. A new north-east members’ fishery has opened its doors. Fish industry figures say they are suffering from huge uncertainty over Brexit as they urged MPs to deliver on the vote to the leave the EU without further delay. Retaining fishing quotas and supporting a discard ban in principle are two key aspects of a Scottish Government paper on the future of fisheries. Two fishermen have been reunited with their boats amid an ongoing impasse over fishing rights. The UK cannot continue to accept the unequal application of a deal with the Republic of Ireland over fishing rights, a Government spokesman has said. Fish Town, which starts tonight on BBC One, will showcase Peterhead, the UK’s biggest fishing port, and is narrated by Game of Thrones star James Cosmo. A north-east couple today spoke of their devastation after vandals tried to torch a boat named in memory of their late mothers. 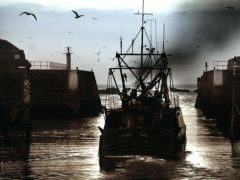 A scheme aimed at boosting the health of the north-east fishing industry has officially launched. An otter has died after it got caught in old fishing gear in a loch. A fisherman got more than he bargained for in the River Dee after catching a cash-filled sporran. A north-east campaigner has welcomed the government’s plan on how fishermen can take back control of Scottish waters following Brexit. A north-east museum is celebrating its 20th anniversary. A statue paying tribute to Aberdeen’s fishing heritage will be unveiled next week. We’ve taken a look back through our archives showing how the fishing industry in the north-east used to look. Fishermen risk fresh betrayal under the latest Brexit Bill amendments an MSP has claimed. A Scottish Minister has pledged to raise the issue of soaring business rates within the fish processing industry, following a visit to the North-east. A campaigner is set to make a return after more than a decade to fight for the North-east fishing industry. A North-east couple’s dream of providing shelter to fishermen from across the world has moved forward.